One of the difficulties that many of us face is getting paid what we’re worth. It’s hard to feel good about your job when you aren’t receiving the compensation that you know you deserve. But how do you overcome low wages that you might be receiving? The first step is to have an accurate idea of what you’re worth. This means that you need to do research. How much does someone with your experience and education normally command in your market? Web sites like Salary.com and PayScale.com can help you figure out how much someone like you should be making in your market. In addition to knowing what others in comparable positions make, take a look at what you offer the company. Do you bring something unique, that the company doesn’t want to lose? Take an honest look at what you provide. Be realistic about how you fit in to the company and what skills and expertise you bring to the table. Knowing what you’re worth is vital. Now that you have an idea of what you should be paid, it’s time to prove your worth. Look for ways to quantify your contributions. Whether it’s an improvement in sales numbers, or whether it’s the completion of an important project, or whether it’s because you have more responsibility, you need to be able to show that you have contributed enough that a pay raise (or some other compensation) is warranted. Getting paid what you’re worth requires that you know what you’re worth, and that you can show that worth to others. You might not like talking about how much you add to your company, but the reality is that you need to let others know how much you are worth. Don’t forget to make efforts to improve yourself. Additional education or certifications can help you quantify your contributions. Stretch for self-improvement, whether you are attempting to become a better leader, or whether you take classes to improve your writing ability. Self-improvement can make you into a better asset, and if you can show that, you are more likely to see the pay bump you are looking for. If you are sitting around waiting for someone to offer you more money, you are likely to have a long wait ahead of you. Many companies aren’t going to come to you and just offer more money. If your boss thinks you’re happy with your compensation, why would they offer more? Instead, you have to ask for what you’re worth. Go in an ask for a raise. If you aren’t likely to get a raise, look for a new job. In some cases, asking for what your worth means applying for a new position at a company that values what you do. In some cases, you can take an offer from another company and use it as leverage at your current company. Part of asking effectively is confidence. If you doubt what you are worth, it can be sensed. Others can tell that you might not be confident that you deserve what you are asking for. If you portray doubt that you are worth more to the company, your bosses will recognize this and they may not agree with you. Could Tweeting About Your Job Get You in Trouble? In order to help you project confidence, you can improve your posture, and speak with certainty. Do your research so that you are certain of your worth. When you research your position, and when you take the time to quantify your contributions, you can build your confidence at the same time. A vague feeling that you are being shortchanged is not the same as confidence that you are worth more. 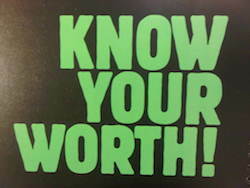 Know that you are worth more, with that knowledge grounded in research and results, and the confidence will come. If the confidence does not come, take some time to go through affirmations. Make positive statements about what you should be making, and remind yourself that you are worth what you are asking for. Once you have built up that confidence, you are ready to ask for what you want.